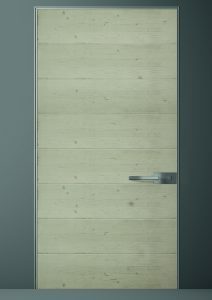 The Oikos Synua Concrete is a unique concept in front door design. Designers Adriano and Rossi took inspiration from the materials used in the art and architecture of Venice. As a result, we have been given these these stunning door finishes. 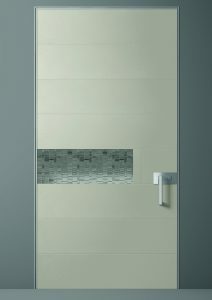 Now, you the customer can enjoy the bold statements and free expression allowed in the design of the these doors. This is typical of Oikos. 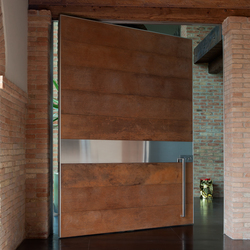 You can see that in designing the Materia Venezia doors, the artists have used another relatively modern material, concrete. Additionally, in many cases, this has been combined with other ancient materials. This has produced an integrated product which is current and blends especially with contemporary architecture. As you can see here in the pictures, the concrete finish may be smooth or textured. Mosaics therefore blend beautifully into the surface and the variety of patterns are limitless. Furthermore, the mosaics used are mainly of coloured glass and allow you many themes of colour and pattern. The designers have used metal strips, brass and stainless steel, to make stunning designs. We have seen other metals specified and used. In addition, you can choose almost any material and have any pattern you wish. This is a truly bespoke door. In conclusion, this list is not limited as other materials can also be used and may be specified by the customer. 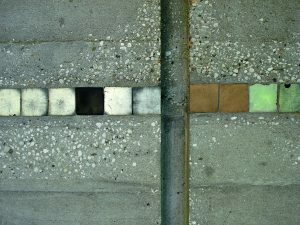 Detail of textured concrete and hand cut glass mosaic. Compliance with the requirements set forth by the standard UN 1435 – 1 establishes the suitability for the intended uses and the CE markings of these products. Oikos doors are supplied and installed throughout the North West of England by Lakes Doors. (For installation in other areas please enquire). Available supply only anywhere in the UK.